Canal Zone, Collection, 1904-78, on white ace pages in binders; good completion mostly used missing mostly the scarcer items, including first issues, map issues with variety, run of later issues with some good mint sets, airmails including complete air officials, due complete, etc. ; includes second duplicate collection, plate blocks, stock, stationery and FDC's. 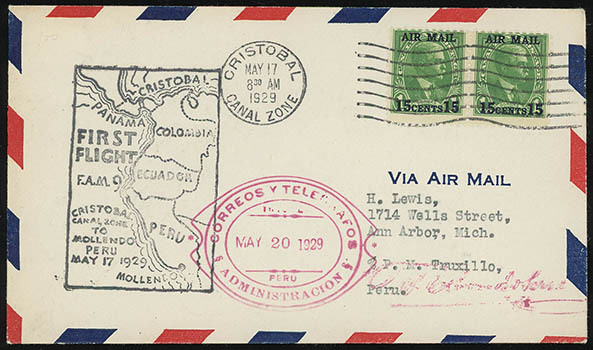 Canal Zone, Air Mail Postal History, collection in mounts on pages, filling a medium box, from 1929-1971, value in earlier airs C1-C5 on various covers, many FAM 5 and FAM 9 first flights, many cover pages have mint & used in mounts, some NH including a nice C2, many covers from the 30's & 40s, followed by mint and used examples CO1-O7 sets, first days from the 60s ending in early 71, also included small selection of United Nations airs study group C1-4, covers, cards, first days, mint & used with possible C3a used, overall very clean and attractive collection worth review, F.-V.F. Hawaii, Territorial Covers, great selection with strength from the late 19th century through the 40's, to the 20's (180+) including U4 to Portland, UX9a to San Francisco, foreign usages to Germany and the UK, very nice incoming covers with a wide variety of town cancels including, Haiku, Puunene, Hana, Hilo, etc., handful of mint cards including a very clean folded UY2 and more, the 30-40's (250+) shows good War time usage with First Flights, a couple of first days and patriotics, navy and cacheted covers; overall a very nice lot with good value, please inspect. Ryukyus, Specialized Collection, mostly mint NH stamps including sheet reconstructions of #1, 4 and 5, mint blocks of 24 and 24a, specialized group of 90 and 190, also C1-3, C9-13 (two sets), C14-18 (five sets), and a nice group of 177 town cancels, interesting lot. United Nations, Collection, mint in 5 Lighthouse albums, 1955 souvenir sheet and retouch variety, including regional issues and additional backstock, nearly all n.h.; owner's approximately cat $3,000. United Nations, Collection, in Lighthouse and two White Ace albums; completion of regular issues and additional offices, souvenir cards, some FDC's, inscription blocks and some early sheets, new issues in original flats, etc. ; lots of material.